It's time for Mosaic Monday once again. 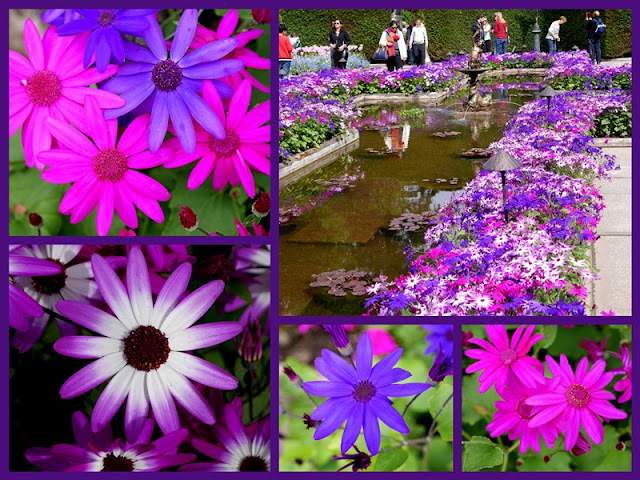 I can't get over how brightly coloured these Cineraria are, seen at Butchart Gardens. Mass plantings of them are like a POW to the eyeballs. Spring has been unseasonably cold thus far, but that all changed over the weekend. On Saturday we took our son and his family out on the boat, just across Sidney Channel. I always enjoy observing the arrangements tossed onto shore by the waves and wind. 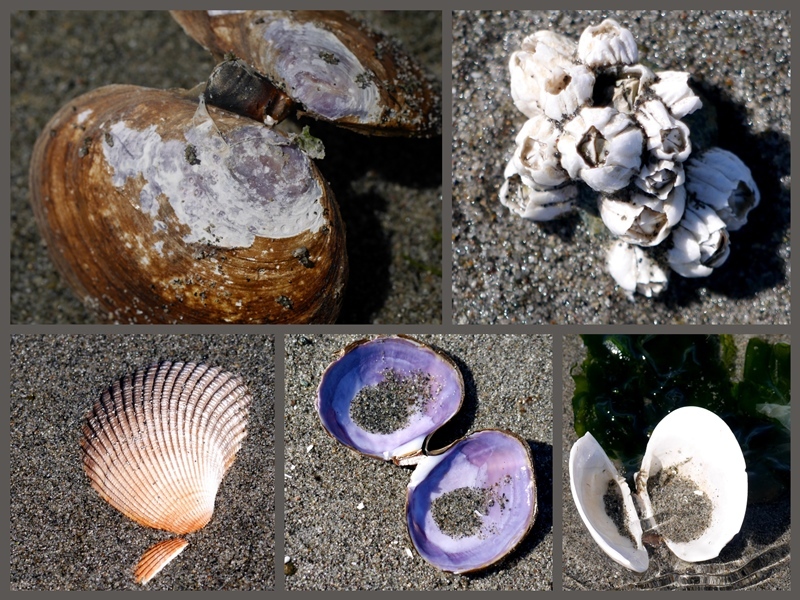 Half-buried clamshells, delicate sand cupped in purple-hued mussels, intricate barnacles, and more. A shallow tide pool + sand + seaweed + shovels + a found piece of plywood to float + imagination = hours of absorbed fun for Bigs and Littles alike. Mr. F also had fun pretending to drive the boat. What a day! Off in the hazy distance is Mount Baker, in Washington State. Three gulls on a log were unfazed by the ferry boat passing in the distance. I don't know if the gulls were nesting or not, but one of them swooped down low over me, squawking all the while, and making it very clear that I was unwanted. It's the Victoria Day weekend here, so tomorrow is another day off. I just love Sunday nights when Monday is a holiday. Well the sun did come out for you and what a wonderful day you had, you just can't beat a day on/by the water. Today is our final day on the beautiful island of Crete, it's been a lovely vacation and I'm certain won't be our last visit here. Isn't it wonderful - summer weather at last! Your mosaics are beautiful - bright cinerarias really pop up in the eye and the kids are happy! Wishing you a lovely eek! How beautiful Mount Baker looks behind the waves, and knowing that it's in another country, never mind, state, just adds to the intrigue of its image. 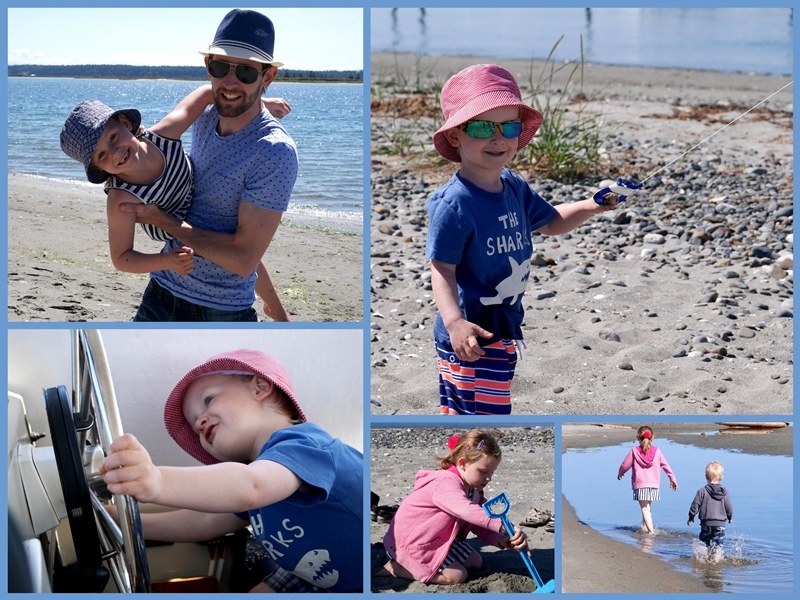 Your grands sure enjoyed their day on the beach and their 'journey out to sea'! The pink and purple pretties are adorable - such saturation in the Cineraria! Have a wonderful Victoria Day, Lorrie! That is great you had nice weather for the long weekend. I love walking the beaches in and around Victoria and collecting shells and driftwood. Those colours of the cineraria are spectacular. Great description - "Pow to the eyeballs"! Wonderful images of the adorable kids and the shells. What a great day! Happy Monday! Beautifully vivid blooms there at Butchart Gardens! I'm loving the bright purple flowers. Glad that your long weekend had shirts and t-shirt weather. It's been chilly over here and many fireworks shows were rescheduled due to rain. That mass planting of those flowers is stunning! Wow! What fun to get a day on the boat with your family! I love the little explorers walking in the water! So cute! Happy holiday! I hope you're having a nice day and doing something fun. LOVE the beach photos and the flowers really are bright and beautiful! Hugs! Hi Laurie, thank you for sharing your visit to Butcharts Gardens and the seashore with your grands. We rarely get over to Vancouver Island to enjoy those pleasures. A pretty mosaic in purple. Our long weekend was a little on the cool side with pouring rain on Sunday but we needed it. Soon we'll be into shorts and summer wear too. Good thing that seagull didn't connect, that would hurt! I hope you have a great week, Lorrie. I left the comment above, Lorrie; not sure why it says anonymous. Wow...those gorgeous flowers have amazing coloring...how beautiful! It looks like there are many treasure to be found on that beach. Great mosaics, Lorrie! Wow! Those colors are really bold and vivid. Glad you enjoyed a lovely day by the water. Beautiful photos as always. The flowers are wonderful indeed, but oh my gosh how I love that beach. For sure the perfect place for all generations on a lovely day. I'd make sure that little guy doesn't get ahold of the keys to the boat though... he looks like he has probably figured out all the other steps for making it go ;))). YOur day sounds absolutely beautiful in every way. I keep looking at the flowers to check they are real - the color is so vivid I could be convinced a Queen had her knaves paint them! Thank you for sharing! May the warmer days with sun continue! I think my future weather depends on it. Still cool and cloudy wth plenty of rain in the forecast here. Wonderful day at the shore with so much for the children to see and do! Living so far inland, it seems like a different world to me. Your photos and text make it so inviting. Maybe someday we'll get out that way. Intriguing! Now that is a lot of pink! It is really gorgeous. I quite agree, Monday's off are the best. You should be done with school soon. Here the granddaughters are finishing their last week and the grandsons, too, I think. I always enjoy your shore photos since we don't have a shore near by. Enjoy. Dazzling colours and happy beach scenes....lovely! It's fun to think we can see the same mountain from each of our different countries and locales. Lovely flowers at Butchart Gardens. The warm up this week has been wonderful. I'm late visiting because of traveling. Hope you have a lovely Wednesday. Lorrie, such beautiful flowers and shells. I especially love the purple one. Thank you for sharing your adventure at the shore with us. Lovely pictures, lovely mosaics - I especially like the family one.